In 1958 on icebreaker MS Magga Dan in the Antarctic Brian saw his first auroras with their "divine signalling" and he dreamed of putting one of those (at the time) new-fangled satellites high above one to measure both cause and effects. In 1959 Brian became Assistant then Associate Professor of Physics with James van Allen and his team in Iowa who had built the first 4 US satellites Explorers 1,2,3 and 4 (Explorer 2 the rocket blew up, as they often did then). 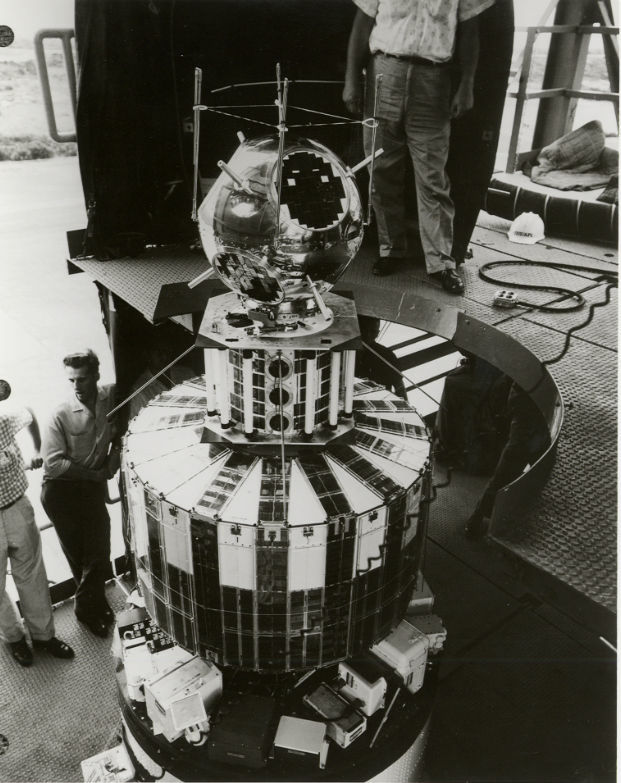 Transit IV-A with its companion payloads was put in orbit with Greb III (top) and Injun 1 middle. In 1960 Brian discovered various exciting phenomena with Explorer 7, and Brian’s Antarctic Dream was complete in June 1961 when his little satellite Injun 1 hitch-hiked to orbit at 1,000 km. With his team of half-a-dozen youngsters, Brian built Injun 1 in less than 5 months to meet the nosecone specifications of less than 13 inches in height and less that 40 pound weight. Many long and exhilarating stories then discoveries. Brian J. O’Brien and James van Allen tracking the Injun 1 satellite. 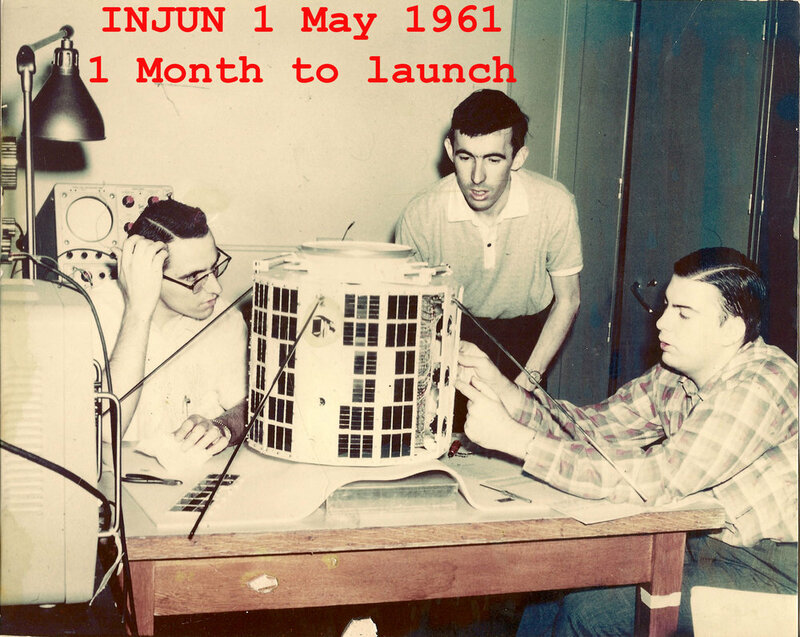 Injun 1 was the first satellite to use digital telemetry, an innovation quickly adopted globally. Brian pictured here with one of the Owl satellites. In 1965, Rice became the first university to design and build its own satellites under the NASA Explorer Program. Owl 1 and 2 were designed to study auroras and Van Allen radiation. On 9 June 1962, the US exploded thermonuclear 1.4 Megaton Starfish device a 400km altitude. Brian’s, dear little Injun 1 survived the intense radiation contamination from the resulting artificial radiation zone, but 8 other satellites suffered such severe damage they failed. Among Brian,s other jobs with Injun 1, he had designed the solar cells and a command-receiver control of its power use, so it was the only satellite to map before and after effects of Starfish. (O'Brien et al., Nature 1962). Brian designed the solar cells to almost cover Injun 1 to control its temperature to be a little colder than normal, to help improve the signal-to-noise performance of his auroral photometer. Brian bought many cheap solar cells, cheap because they were only 6% efficiency, and already degraded, whereas the solar cells of the 8 satellites that degraded were originally 12% efficiency. Brian also later flew several instruments he had used on Injun 1, on first GSFC satellite Explorer 12, with a highly elliptical orbit reaching out to 120,000km. Brian made the first comparisons of identical instruments with the two satellites, so that he could enjoy revolutionary discoveries. Brian changed the original world view that trapped radiation caused a "leaky bucket" phenomena with the trapped radiation being the cause of electrons with energies sufficient to cause auroras. Instead, we showed the intensities of trapped radiation were 3 orders of magnitude less. The new situation, Brian speculated, was that magnetosphere processes more than 100,000 kilometres in the Earth's magnetosphere blown away from the Sun by the solar wind supersonic plasma, energised both electrons causing auroras and a "splash" of others that became trapped. In December 1962 Brian and his team launched the wondrous heavier Injun 3, (his team got Navy approval to double its weight because of its unique measurements of Starfish with Injun 1). Injun 3 joined little Injun 1 (the rocket for Injun 2 had blown up). There are vast stories again there. One of the most important is a heritage issue - Don Gurnett began his fabulous long career with a Very Low Frequency detector which Brian wanted to extend further into a total systems analyses of auroral phenomena. Don's skills and determination led to his plasma probes on Voyager 1 and 2 still carrying them far beyond the solar system. Brian and his team working with Injun 1 and its many “Cheap” solar cells. After the rest of the team had taken the payload to Cape Canaveral for launch, Brian used the break to finalise his temperature control calculations. He realised from his new slide-rule reviewed calculations that the white payload would run Injun 1 several degrees TOO cold, reducing too much gain of the transistors and some other electronics. So he phoned a German specialist he knew from an Explorer 7 press conference, in von Braun's team in Huntsville. Brian arranged to "borrow" a half-full 250 mill bottle of the engineer's best Huntsville lead sulphide black paint. Brian then bought at an Iowa City store a bundle of children's paint brushes with different sized brushes and flew to the Cape. He had also arranged for the bottle to be picked up by one of the team to hitch Cape-Huntsville-Cape on jet return flights which he recalls may have been Air Force. Then in the early morning at the Cape, Brian and Bill together painted black most of the outside parts shown here as white. They had no time for a new photo, but they celebrated with an early breakfast at 3am of strawberry waffles he remembers very well. The temperature of Injun 1 worked fine for its operating lifetime of more than a year, unusually long for those early years.